Praying Mantis made from only one dollar. I added a quarter so that you can see just how small it is when it is finished. All my works are my own designs. They all use dollar bills with no cut, no glue, and no tape. Do you use real money? .o. That's amazing! I wish I knew how to do that! This amazing piece has been featured!! do you add tutorials on how to make an Origami mantis? how did u make that? so you found out how to make a Praying Mantis out of a dollar on your own? Yes, all my work is my own design. Post-modern Origami I like it. do you only use your hands or do you use like needles or toothpicks? I love praying mantis...es? manti? WOW..just WOW. that is amazing! Wow, That Is So Amazing! Your Skills Are Wonderful! Woooaah, those look amazing! I love how many folds were used to make up the body. Are you going to sell your tailent and make a book? You are really good. I cant even make a box. Does the difference in dollar bills and paper matter at all? Yes it does, I prefer the texture of the dollar bill over paper. I like the crispness of it. how much time does one mantis take to get completed? Very small. Your works are amazing! that's insane! how the hell do you do that?! youre amazing! Because you're the first person I've seen on devART who makes origami....I probably will end up faving your entire gallery...great mantis though, looks real cool. how on earth have you managed to do that! so tiny! you amaze me. looked through all your gallery..you..are un true! Your paperfolding is really incredible! WOW SOO COOL!! !HOW CAN YOU DO IT!!! 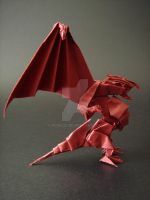 Amazing paperfolding skills. Dig the details!